As a new trading day gets underway, the S&P 500 rests a mere seven points below its all-time high: Last Friday, the index closed at a record 2,439. But is that a reflection of a healthy market overall? Or a mere handful of stocks propping up everything else? That’s a crucial question — because as we said a few weeks ago, most late-stage bull markets share a common trait: The major stock averages look strong only because a few stocks are going bonkers while the vast majority are going nowhere or going down. That’s how it went during the late stages of the dot-com bubble: Microsoft, Intel, Dell and Cisco soaring higher, the rest of the market just plodding along. The S&P 500 peaked above 1,500 in early 2000. By late 2002, it was below 800 — a brutal drop of nearly 50%. Last Friday we mentioned how Facebook has rocketed from a $100 million company at the time it went public five years ago… to No. 5 on the list of the most valuable publicly traded companies in the world. The only companies ahead of it on the list are Amazon, Microsoft, Alphabet (Google) and Apple. 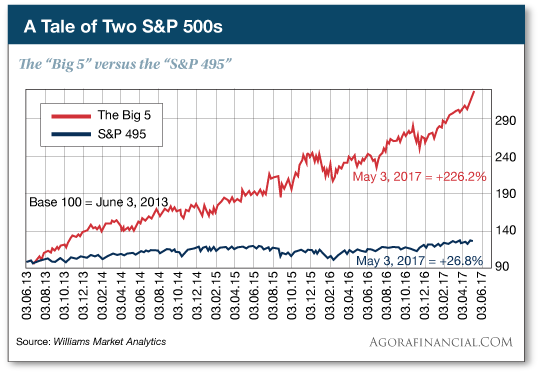 Mr. Williams illustrated the phenomenon last month with a chart showing the performance of the Big 5 relative to the other 495 stocks in the S&P 500… going back more than four years. And so it goes this year: The S&P 495 is up about 4%. The Big 5 are up nearly 25%. No, this doesn’t mean we’re in for an imminent rerun of the dot-com crash. But we know a pivot point is approaching… and it pays to adopt a new strategy. Which is why we can’t stop thinking about our newest contributor’s prescient call about Facebook 10 years ago. As we mentioned on Friday, James Altucher was nearly laughed off CNBC one day in July 2007 when he ventured that Facebook would one day be a publicly traded $100 billion company. At that time, it was barely three years after Mark Zuckerberg launched “Thefacebook” from his Harvard dorm room. It was already privately valued around $1 billion. But to grow 100-fold from there? Impossible, scoffed the other CNBC talking heads. The rest is history: When FB went public in May 2012, it was a $100 billion company. With his hedge fund and private-equity background, James knew exactly what to do when he made that prognostication in 2007: He invested via the back door. “I invested in every marketing company I could find that was working on products related to Facebook marketing,” he says. “I made a killing. “There are 8,000-plus public companies out there in the public markets,” James explains. Newspapers like The Wall Street Journal maybe focus on 10 of those companies. We’re talking the giants like Apple, Google, Tesla, etc. “But those aren’t where the big money is being made. Now recall the context in which James made that Facebook forecast, and his subsequent “backdoor” investments. It was July 25, 2007. The earliest tremors of the housing/credit earthquake were already reverberating through the markets. Only nine days later, Jim Cramer had a meltdown on CNBC, tearfully begging Federal Reserve Chairman Ben Bernanke to “stop acting like an academic and do something!” The S&P 500 reached its peak in October… and took a sickening 57% plunge over the next 17 months. That’s right… Backdoor investing can help you survive and even thrive during a vicious market downturn — like the one the “S&P 495” phenomenon is foreshadowing. In less than 24 hours, James will host an exclusive event for Agora Financial readers, revealing the secrets of “the 1,000% backdoor play.” Play it right, and he says you could make 10 times your money before the end of this year. This online briefing is tomorrow at 1:00 p.m. EDT. If you have a lunch appointment, we urge you to reschedule. If you have work obligations, get them out of the way early. This is an event for which James ordinarily charges $525… but because he’s joining forces with us, we’re making it available FREE. All we ask is that you sign up in advance at this link. As noted before, stocks are little moved today… and so it goes with most other asset classes. With one notable exception. Crude is down more than 4%. The Energy Department delivered its weekly oil inventory report this morning. It showed a surprise 3.3 million barrel increase in U.S. crude stockpiles. At last check, a barrel of West Texas Intermediate is a few pennies over $46. Which isn’t necessarily a bad thing for U.S. oil producers. As Jim explained last week, many deep-pocketed investors were able to buy drilling rights and equipment at fire-sale prices during the worst of the shakeout in the U.S. shale patch last year. 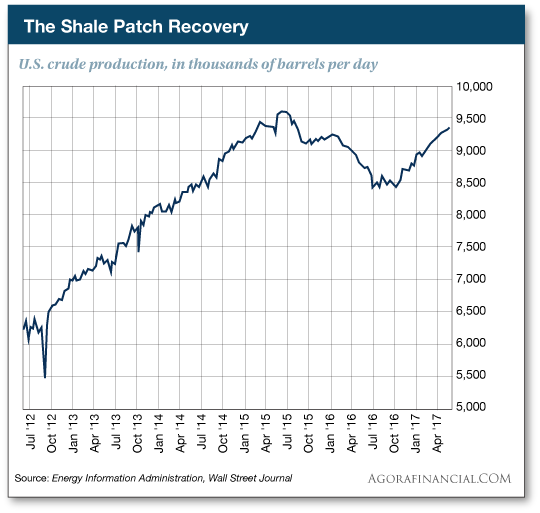 Between that and the fact that U.S. producers are becoming ever more efficient at squeezing oil out of shale rock… these U.S. shale plays can be profitable even if crude tumbles below $40. Zach suggested a way to play it this week in his premium advisory Income on Demand. If you haven’t tried his “perpetual income strategy” yet, you need to see how easy it can be. We’re now one day out from former FBI chief James Comey’s testimony to Congress… and one week out from another Federal Reserve interest rate increase. Neither bodes well for the stock market, says Jim Rickards. “Much of the stock rally this year, “ he says, “is in anticipation of Trump policies on tax cuts, fiscal stimulus, infrastructure spending, health care reform and deregulation. Unfortunately, almost none of the Trump agenda has come to pass, and much of it may never see the light of day. Meanwhile, “Janet Yellen and the Fed are throwing a double dose of cold water on Trump’s plans,” Jim goes on. “The Fed will definitely raise interest rates next Wednesday and indicate plans for at least one more rate hike, maybe two, later this year that markets will have to factor in. In addition, next Wednesday the Fed will provide more explicit guidance about plans to reduce the money supply in order to normalize its balance sheet. This quantitative tightening, ‘QT,’ is the opposite of QE and will have the same effect as raising interest rates even further. The 5: We addressed this question with Jim Rickards’ help less than three weeks ago. 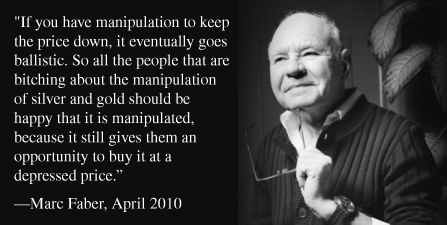 Manipulation of the precious metals market is real… but we feel genuinely sorry for the crowd of everyday investors who find meaning in their lives by identifying every anomaly in the weekly Commitments of Traders reports, convinced this time they’ve found the smoking gun that will send precious metals prices skyrocketing and send a bunch of banksters to jail. Sorry, that’s not how we’re going to get to $10,000-an-ounce gold. Oh, but we’re not done with the reader accusations we’re suppressing the truth! James Altucher’s remarks this week about Bitcoin (“I think Bitcoin has about a 1 in 100 chance of being a survivor”) prompted the following outburst: “Why do you folks continue shooting yourself in the foot with TOTALLY bogus info? “Please come clean about why you so vociferously keep bashing Bitcoin, all the while it is rising like gangbusters. We’re guessing the reader took exception to the Bitcoin remarks of our Ray Blanco and Matt Insley in a couple of other Agora Financial publications last month… and now he’s spoiling for a fight, misinterpreting James’ remarks. Note that James said it’s unlikely Bitcoin will be “a survivor” among the many cryptocurrencies out there. That doesn’t mean its price can’t leap another four or five times higher in the meantime. But is that because of Bitcoin’s unique advantages? Or is it, as DoubleLine Capital’s Jeffrey Gundlach recently averred, a function of hot money from China looking for anything it perceives as safe? He says it’s no coincidence Bitcoin has doubled at the same time the Shanghai Composite Index has corrected 10%. Now for the final installment of James Altucher’s “ultimate cheat sheet” for investing all your money. It costs almost nothing to start a business. Find something people want and start posting information about it on a blog and then upsell your services on the blog.Or write 1000 small books about different topics and publish them on Amazon. You can do this on the side while you learn and have a full time job and then when you are ready, you can jump to your other passive streams of income. I have a podcast coming up soon with a guy who makes $25,000 a month doing this. Note: It takes a lot of work to find “passive” income but when it happens, it’s worth it. These are some ideas. There are many others. Invest in experiences rather than possessions. Figure out interesting and unique experiences you can have or places you can go to (but they don’t always have to be places). Experiences pay much higher dividends than an extra TV or a nicer car. Books. Reading is the best return on investment. You have to live your entire life in order to know one life.But with reading you can know 1000s of people’s lives for almost no cost. What a great return! Q) Should I save money with each paycheck? Better to just make more with many streams of income so you don’t have to worry about going broke. And then saving will come naturally as you make more money. Don’t forget that a salary will never make you money. After taxes and the daily grind, and your exhaustion and the feelings of “I hate my job,” and then inflation and then new expenses (kids), you will never be able to save. Avoiding Starbucks every day won’t make you a millionaire, that’s a fact. I say it glibly, “try to make more money.” I know it’s not that easy. But in the long run, if you have a constant focus on alternative ways to make more money, then you will. R) What else should I do with my money? Money is just a side effect of health. I talk a lot about the daily practice I started doing when I was at my lowest point. I know now after years of doing it that it has worked. I’ve done very well with it, and I started doing it when I was dead broke, lonely, angry, depressed, and suicidal. I didn’t start it from a position of privilege. Here’s the whole thing: stay physically healthy in whatever way you know how (sleep well, eat well, exercise). Be around good people who love you and respect you and who you love and respect, and be grateful every day. Think of new things each day (or all day) to be grateful for. “Gratitude” is another word for “Abundance” because the things you are most grateful for, become abundant in your life. And finally, write down 10-20 bad ideas a day. Or good ideas. It doesn’t matter. After exercising my idea muscle for six months, I felt like an idea machine. It was like a super power that just wouldn’t stop. More on this in another post. Money and abundance in your life is a natural side effect of the above. I know this for myself but now since writing about it for almost four years I can tell you from the letters I get that it works for others. S) What’s in it for you? I don’t know. I used to write about money stuff because I wanted investors in my hedge fund, or I wanted to sell books, or get speaking engagements. Now I want none of that. I hate writing about finance now. Because it’s almost all bull**** and I don’t want to be like the other BS. But I get worried that in a world of increasing economic uncertainty that more and more people are getting “stuck” and getting lied to and are scared about what is happening. Most people will think I am giving bad advice. That’s fine. I just am trying to avoid the BS and I hope you do also. Too many people I know are nervous and depressed. If they want you to put your money in a savings account, even “so you can get the interest” I would politely decline. There’s a reason they are asking you to do this and I have no idea what it is but it’s not good for you. You won’t get rich investing your money but you can do very well. And if you combine that with investing in yourself, you will get wealthy. But only if you remember that financial wealth is a side effect of real inner wealth. This is the most powerful investment you can do with your time and your life. You can always make money back when you’ve lost it. But one single split moment of stress and anxiety you will never make back again. Investing in the future will never bring back the past. To be able to sit and not have a million stressful thoughts racing through your head. To be able to appreciate everything around you for the abundance it is. Most people think they need to say “thank you” to the world. But the world is constantly saying “thank you” to you for being alive, for creating new things, new energies, new experiences. Every day give the world at least one more reason to whisper “thank you” to you. If you can hear that whisper, everything else, every gift in life, becomes expected. You earned it. Using this strategy — he’s used it in his own portfolio — James says it’s entirely possible to make 10 times your money between now and the time the calendar flips to 2018. That’s less than seven months. Tomorrow at 1:00 p.m. EDT James takes the wraps off this strategy during a live online event exclusively for Agora Financial readers like you. The cost of entry is FREE… but we do ask that you RSVP so we know how many people to expect and our servers won’t crash. Here’s the signup page.